Again, is the Contact 9 a ski that can deal with heavier cruddy conditions, or wetter spring stuff?? How does it compare to the RX8? I haven't skied the RX8 so can't give you a comparison. I think the Contact 9 would be an excellent groomed snow ski and excellent for working on skills. I didn't notice any tip deflection in piles of snow or easy, soft bumps. It handled packed powder in the trees better than I do; it did get deflected by tree roots . I would feel comfortable skiing it anytime I would my other slalom footprint skis, but for heavy cruddy conditions or wetter spring stuff I would probably ski my iM78's (177) anyway. My summary, felt like a very good groomed snow ski with good versatility, and believe it would be better for someone really trying to work on skills because skill development should imply slower speeds. Speed masks technique problems (speaking first hand here). No question in my mind the RX8 is a great front side western ski....well, cause I skied one out west. As far as skiing soft snow, mash potato's, crud broken snow....if your ski skills are good, strong 2 footed transitions, then no problem carving up that menu. If you want more forgiving, go a bit wider but you loose a bit of that quick turning you're looking for. Anyways, you've got the Watea's for those conditions....did you forget... needing anything to improve memory..
That Watea can ski it all....but for when you're in the mood for laying down precision carved short radius turns, I know the RX8 can perform that and then some for sure! Although I have not skied the Contact 9 or 10 I have skied the Contact Exclusive or 11....and it is a rippn' ski too. I'm sure it's siblings are highly capable of awesome front side performance and real skiers reviews really likes the 9. Demo if you can but I know with either choice...you'll be smilin' all the way to the lift line! hehe...yeah...I guess I shouldn't be too concerned about the crappola snow abilities of the RX8, since it is supposed to be my hard snow groomer specialist! The Wateas are quick for a midfat, but I didn't trust them (or I didn't trust myself on them) in the early morning half-frozen corduroy on a steep double black or half frozen steep mogul field, and sometimes I just shoot up to Snow Summit/Big Bear around this time of year and ski only until 1pm or so when the sun gets strong and the frozen granular stuff gives way to mush. Anyway, I may not demo since I am looking out for a great deal on one of these guys, and may have to jump on em if the price is right. I've seen the Contact 9 fairly widespread...best prices so far have been in the 350-400$ range.. The RX8 seems to be scarce, and not very deeply discounted when found. The Contact 10 and Limited seem scarce as well and not often deeply discounted....I also am noticing that their turn radius is more in the 14/15m. range rather than 12/13 range..
Do you guys have a feeling about 165 or 170 (172)cm. for the RX8 and Contact 9? Yep...I think Jim is right on...165.....those Contact 9 could be very appealing. Move the LD12 bindings into their forward position and ski that sucker like a slalom ski...go ahead, trust it. Keep you hands out in front of your body so you can see them at all times....no go rip a few! I say this because mine in the 176 length are surface mounted. I had them re-mounted 2cm forward and oh boy...what a difference. 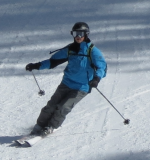 Ski it centered, ski it hard.....even at the length....it feels very responsive on hard pack and soft snow both. Ok, so when you buy the Contact 9, bring it with you to Real Skiers 3 this year.....would love to get it a ride!